Every one of us has trouble with excess fat in the body. However, regular exercise and keeping a strict diet may help you lose weight in some spots, but some areas require a specific workout in order to lower the fat rate. 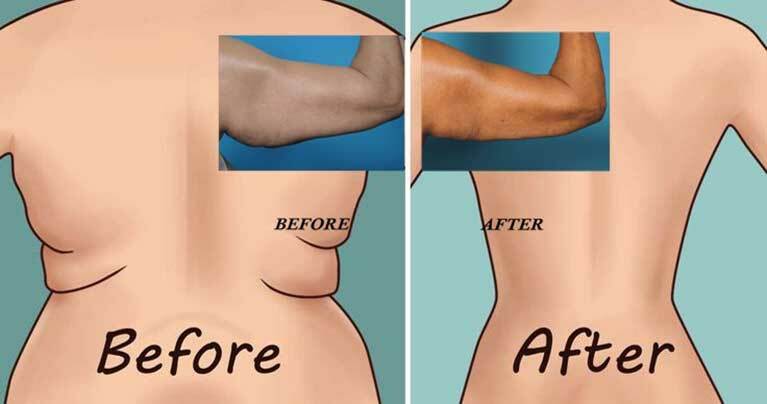 The back fat and the underarm flab are the most challenging areas of the body. That’s why sometimes many people want to give up. However, there are lots of aesthetic and health reasons why you would like to target these specific muscles. You may solve your fat problems by hiring some personal trainer or attending classes at the local gym. Although very effective, these solutions can be quite expensive. For this reason, this article provides some simple exercises that can be practiced anytime and anywhere. Also, you need neither equipment nor money. Do these exercises for several weeks, and you will notice amazing results. You will be surprised to see a completely sculpted and toned back in just a few weeks. This super effective exercise requires no equipment and targets all those small spots in your upper back. Lie on the floor with your face down and stretch your arms to the side. Raise your chest and head off the ground. Make sure the back part of your hands faces the ceiling. You will notice a tight squeeze between the shoulder blades. Do 3 sets of 15 each. According to the head trainer and co-owner of The Studio by Remorca Fitness, Nedra Lopez, these exercises successfully target the entire upper back, strengthen the muscles and improve the posture. “T” Lie on the ground with your face down and stretch your arms in the form of the letter “T.” Make sure your palms are facing the floor while you raise them and squeeze the shoulder blades. Stay in this position for 7 seconds and then release the arms. Perform two sets of twenty repetitions. “Y” Remain in the same lying position but stretch your arms above the head in the form of the “Y” letter. Slowly raise your arms while squeezing the shoulder blades together. Make sure you keep the arms straight and then slowly release them. Perform 2 sets of 20 repetitions. “I” From the same lying position, stretch your arms above the head in the form of the “I” letter. Raise the arms straight up while squeezing the shoulder blades together and pushing them down towards the lower back. Perform 2 sets of twenty each. This exercise will effectively tone your inner back without any equipment. Lie on the floor with your face down and extend the arms over your head. Pull the chest, arms, and legs off the ground. Perform 3 sets of ten each. Not only this exercise will improve your posture, but it will strengthen all the muscles that keep your back straight. This is one of the easiest exercises that will provide excellent result in reducing the back flab. Start in a plank position, rest on your forearms and make sure you keep the legs wide apart. Drop your chest down but make sure you keep the hips from moving. Make your shoulder blades squeeze together. Perform 2 sets of 20 each. This exercise will help you tone your arms and back while improving your blood flow. Straight your back and start on all four. Stretch the right arm and the left leg. Stay in this position for several seconds. Alternate and repeat the repeat the exercise. This exercise will stretch the shoulder and spine muscles, improve the flexibility and blood flow. Also, it will improve your stability and balance. This is just another simple exercise that can be literally performed everywhere. Lie on the floor with your face down and stretch your arms to the sides with the palms down. Make sure you keep your head down while you raise your arms above the head. The feet should stay a few inches from the wall, and the back should be in a straight position. Keep your arms straight while you lower them back to the sides. As we have mentioned before, you do not need a personal coach or a gym to tone the unwanted back flab. These exercises are highly effective for treating these specific areas of the body. For a very short period, you will return your confidence and wear the strapless dress or bathing suit again.